Small is beautiful. Today Aihole may be a small riverbank village in the Bagalkot district of Karnataka, but in earlier times it was the centre of the powerful kingdom of early Chalukyas of Vatapi (now called Badami) who made their mark in history as prolific builders. It is no surprise that Aihole, variously called as "Ayyavole" and "Aryapura" in early inscriptions, is a famous travel destination on its own right thanks to its vast assembly of some 125 temples and caves. These 125 temples are divided into 22 groups. 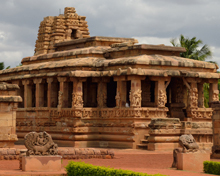 Durga temple is the most famous of the temples in Aihole. 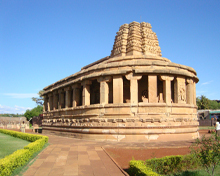 Ladh Khan Temple, Surya Narayan Temple, Gauda Temple, Kondi Group of Temples, Maguti Temple, Hucchimalli Temple and Ravanphadi Cave are other attractions in Aihole. The beauty of the Aihole temples means that a trip here should definitely be included in your South India itinerary. The chief attraction among the temples built by the Chalukyan kings at Aihole is Durga Temple, which derives its name from Durgadagudi meaning 'temple near the fort'. Desined like a Buddhist chaitya (prayer hall), the Aihole Durga Temple is dedicated to Lord Vishnu. The monument is charatrised by circular colonnaded veranda elaborately decorated with intricate carvings and amazing sculptures including those of Narasimha, Varaha and Mahishasuramardhini. The only dated architectural monument in Aihole, the Jain Meguti Temple was built by Ravikeerti, the commander & minister of Pulakesin II atop a small hill. The inscription on the outer walls of the temple puts the temple’s construction at 634 AD. This oldest temple in Aihole dates back to the5th century AD. Located south of the Durga Temple, Lad Khan temple is dedicated to Shiva and is an example of the Malaprabha style of architecture. The cave temple of Ravanphadi is another prominent landmark of Aihole. Buiklt in the 6th century AD, this rock-cut temple is built in the early Chalukyan style of architecture. The entrance of the temple is embellished with relief images of Nidhis with their pot bellies. The walls of the temple are decorated with intricate carvings of Shiva, Parvati, Ganesha and Karthikeya. The panel depicting the cosmic dance of a 10-armed Shiva in the company of his consort Parvati is the most beautiful sculpture in the Ravanphadi Cave temple. 20 km from Aihole Pattadakal is famous for its awe inspiring chiseled temples built by the Chalukyas in the 7th and 8th centuries AD. Located on the banks of the Malaprabha River this World Heritage Site is home to several temples including Virupaksha Temple, Chandrashekhara temple, Sangameshvara Temple, Mallikarjuna Temple, Jambulinga Temple, Khadasiddheshwara Temple and Galaganatha Temple. Of these, Virupaksha Temple is the finest of all. 44km from Aihole, Badami in the Bagalkot district of Karnataka is one of the well-known tourist attractions of India. Badami was once the regal capital of the powerful kingdom of early Chalukyas or Chalukyas of Vatapi as they are called. 100 km from Aihole, Bijapur is a famous travel destination in Karnataka. 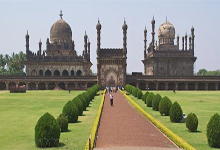 Referred to as the Palmyra of the Deccan in the medieval times, the place is home to some wonderful mediaval architecture sights like Gol Gumbaz, Ibrahim Rauza, Bara Kaman and Gagan Mahal. 156 km from Aihole, Hampi is the seat of the Vijayanagara empire. Situated on the southern bank of the river Tungabhadra, Hampi is a UNESCO World Heritage Site. Air: 162 km from Aihole, Belgaum Airport is the nearest domestic airport and Bangalore International Airport is the nearest international airport (514 km). Bangalore airport is well connected to major cities in India and abroad. Rail: 34 km away, Bagalkot railway station is the nearest railhead to Aihole located. Bagalkot railway station is well connected to important cities in India. Road: Aihole is connected by good motorable roads to all major cities and places in India. Some of the cities and places connected with Aihole with good motorable roads are Pattadakal (20km), Badami (44km), Bijapur (100km) and Hampi (156 km).